It's the last week of Project Run & Play already! I have been sewing along and you can see what I made for week 1 (the remix challenge) and week 2 (candy inspired). 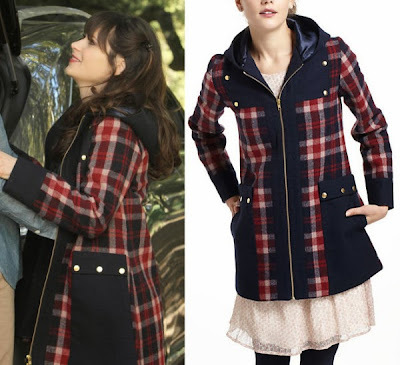 The third week was 'mad for plaid' and I had this coat in mind for that...but didn't get to finish it in time. But the fourth and final week is supposed to be all about your signature style and I think this plaid coat fits in perfectly for that theme too. When I saw the coat pictured below I just HAD to make it! It's from Anthropologie and was worn by Zooey Deschanel in New Girl. 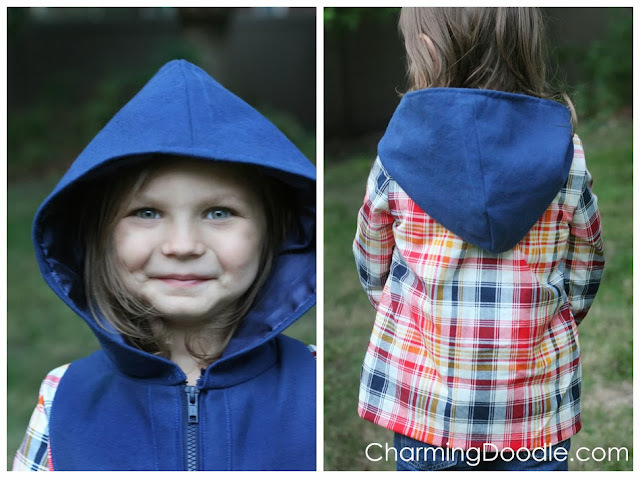 I seriously want one of these for myself and plan to make one as soon as I come across the right plaid. 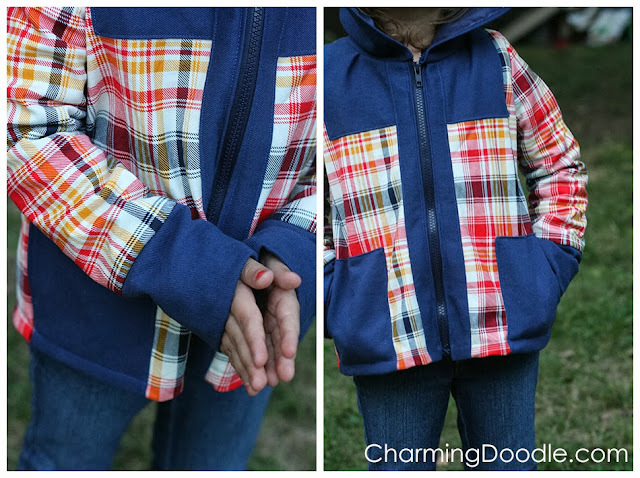 I already had the perfect plaid for a little girls' version of this coat and so that's what I made. Why is this my 'signature style?' Many reasons, actually. 1. I'm cheap. I love the look of Anthropologie, but wouldn't buy something like this at full price. 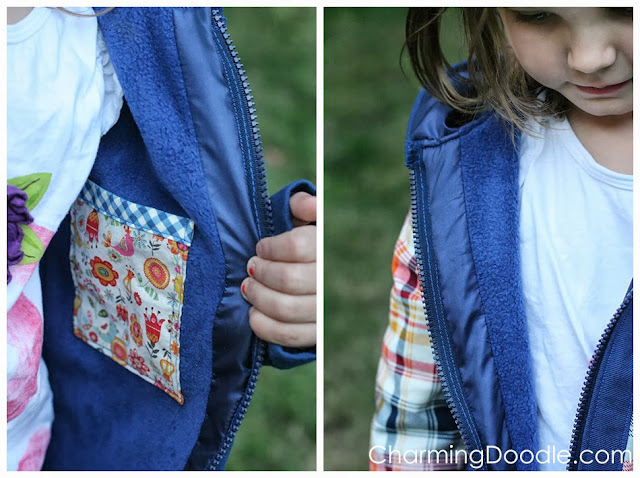 The beauty of sewing is that if you want the look of something but it's too expensive, or it's unavailable in children's sizes...you can make it! 2. I am still pretty new to sewing and 'knock-offs' are a good way for me to test out some new pattern making skills. If I have something I'm closely replicating, it helps me stay focused and figure out how to sew something new. I do a lot of knock-offs for this reason. But someday I hope to be able to think up these things entirely on my own. I'm getting there. So let's look at some of the details of this coat. I used a hooded sweatshirt pattern for the base of this jacket. (McCall's M6782) The cotton fabric I used (Notting Hill by Joel Dewberry) wasn't super heavy weight, though, and I wanted the jacket to last well into the Fall and stand up to colder temps. So I made the jacket a size larger than my girl normally wears and then basically made a second coat out of a fluffy fleece to act as a lining. The fleece is nice and soft against her skin and makes the jacket more practical because it can be worn longer. I also added a navy anti-static lining for a pop of shine inside the hood and against the zipper so the fleece doesn't get caught in the zip. To top off the inside of the jacket, I added a fun pocket for the hidden 'treasures' my girl loves to collect. The hood is a bit oversized and to be honest, Isabella doesn't love hoods. So most of the time I think it'll just hang to the back. I think it still looks cute, though. The navy fabric on the outside of the hood and in the front contrast pieces is denim. I made the sleeves a bit shorter than normal and then added a double-sized cuff. 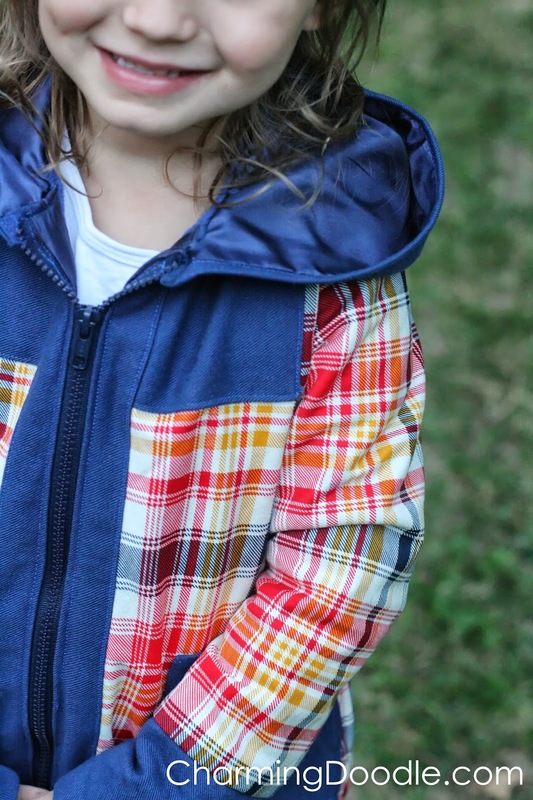 There's plenty of room for this little girl's arms to grow in this jacket. I also made the front navy patches into pockets to keep those little hands warm. I'm so happy with this jacket and, more importantly, my baby LOVES it! Today she wore it over her Belle dress to pick up the big kids from school. Ha, ha, ha! I'm definitely adding a bigger version of this coat to my to-sew list for myself. If you know of a good plaid fabric please share! This is so cute. You did an amazing job! This is such a fun coat!!! Great job! Dude, this is amazing!! You nailed it! Cute and it looks so comfy! Great details! Love this jacket...seems like a lot of us are thinking cooler weather for this challenge. The inside pocket is so so cute! What a great jacket, Elisa! Love the plaid you used! I love this! I'd definitely wear one :-). Let me know when you've mastered the adult version so I can place my order! What an amazing job you've done! The jacket looks professional!! Love the coat! I work for www.thescottishweaver.com and we sell pretty much every tartan available. If your looking for cute plaids, check us out!